​In addition to selling products we also deliver, install and inventory our first aid cabinets at your business or job site. 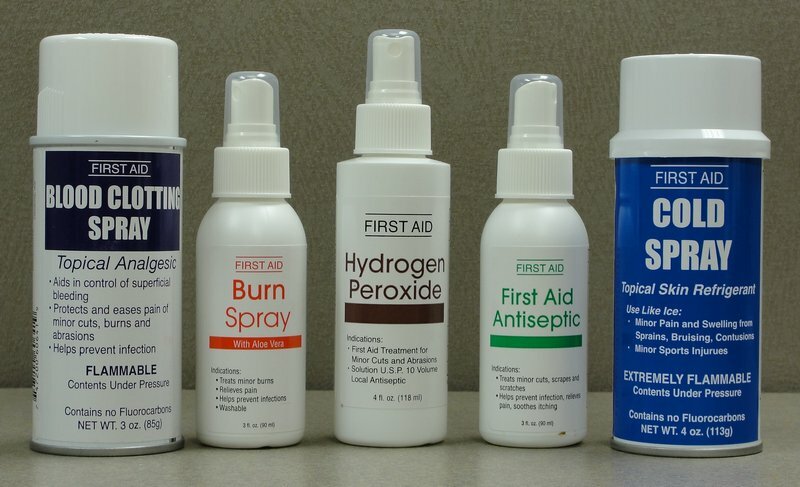 We carry a large selection of first aid products for the workplace including wall mountable first aid cabinets, vehicle kits, hearing and eye protection, bandages, medicinal tablets, and much more. Be prepared for any emergency. 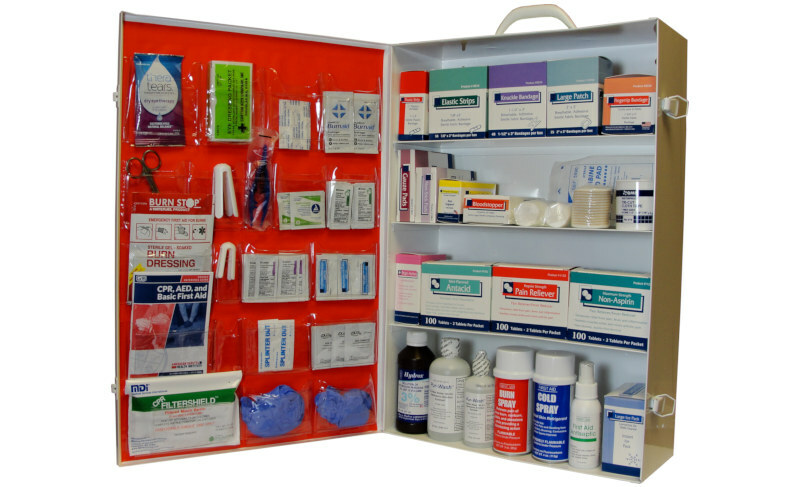 Our 4 shelf first aid cabinet will allow you to provide proper first aid for your employees. This kit meets ANSI/ISEA Z308.1-2015 standard and OSHA guidelines. Available in Class A or Class B. Contents include products to treat bleeding, cuts, burns, eye injuries, contamination, shock and personal discomforts. Can be wall mounted. Dimensions: 22.5 x 15.25 x 5.6 inches. 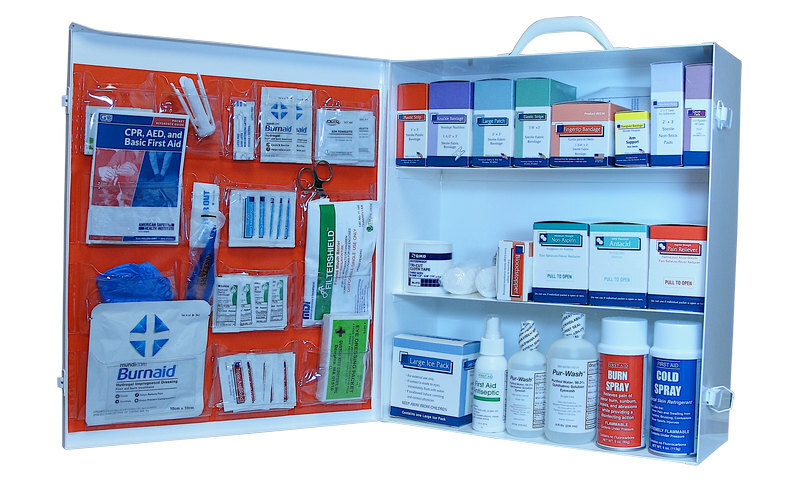 The 3 Shelf First Aid Cabinet is designed to meet the needs of smaller facilities or large facilities with multiple cabinets.This kit meets ANSI/ISEA Z308.1-2015 standard and is available in Class A or Class B. Contents include products to treat bleeding, cuts, burns, eye injuries, contamination, and minor personal discomforts. Can be wall mounted. Dimensions: 16.5 x 15.25 x 5.6 inches. 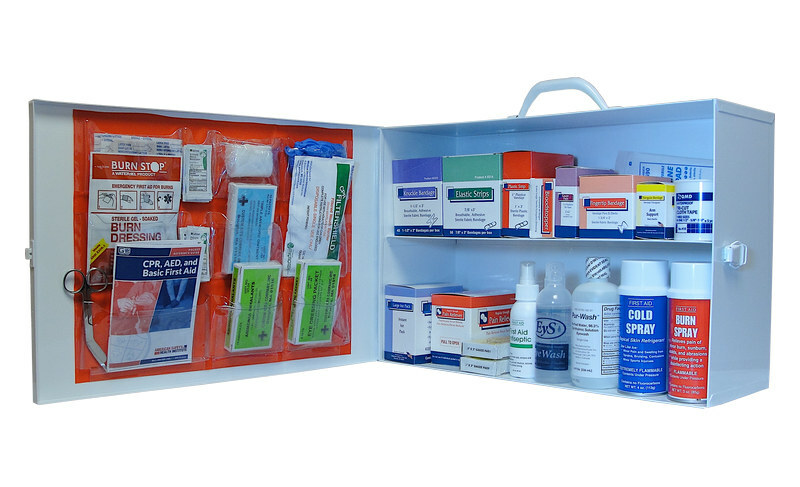 Our 2 shelf first aid cabinet will allow you to provide minimal first aid for your employees. This kit meets ANSI/ISEA Z308.1-2015 standard and is available in Class A or Class B. Contents include products to treat bleeding, cuts, burns, eye injuries, contamination, shock and personal discomforts. 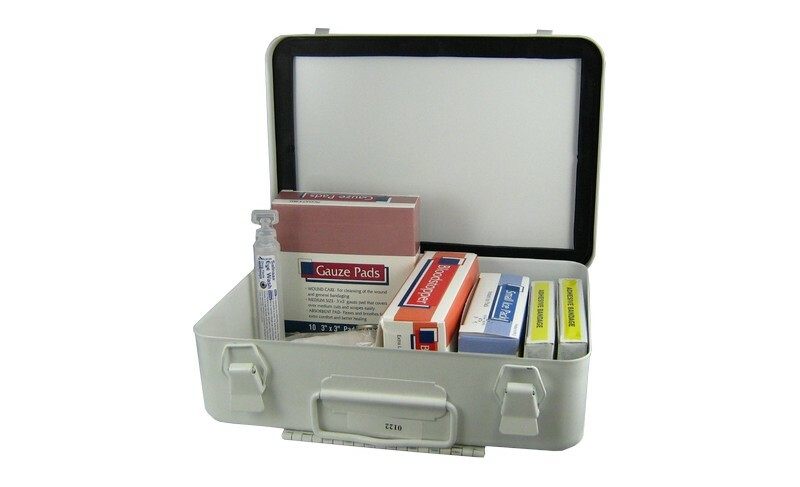 Our unitized first aid kits are available in metal and plastic. These kits are great to carry in trucks, boats, constuction areas. Available in 5 sizes: Small 10 unit kit, Standard 16 unit kit, Deluxe 24 unit kit, Econo 25 unit kit and Premium 36 unit kit. 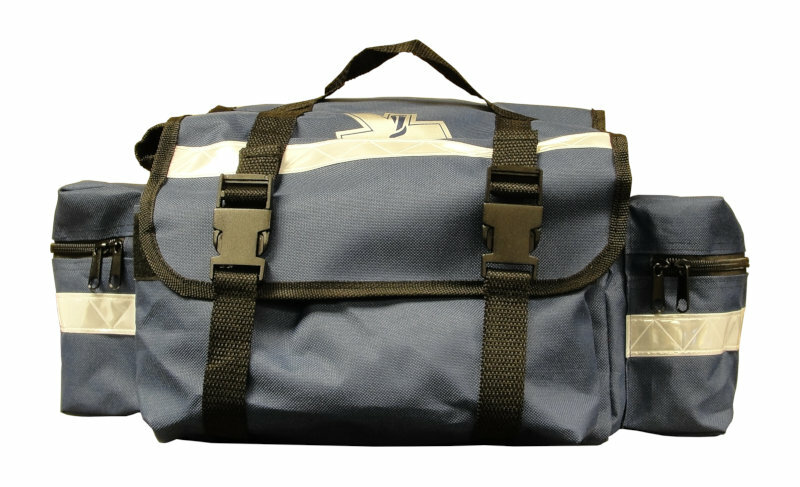 The First Responder Bag keeps you ready and supplied for emergencies with the equipment stored in this convenient soft sided bag. 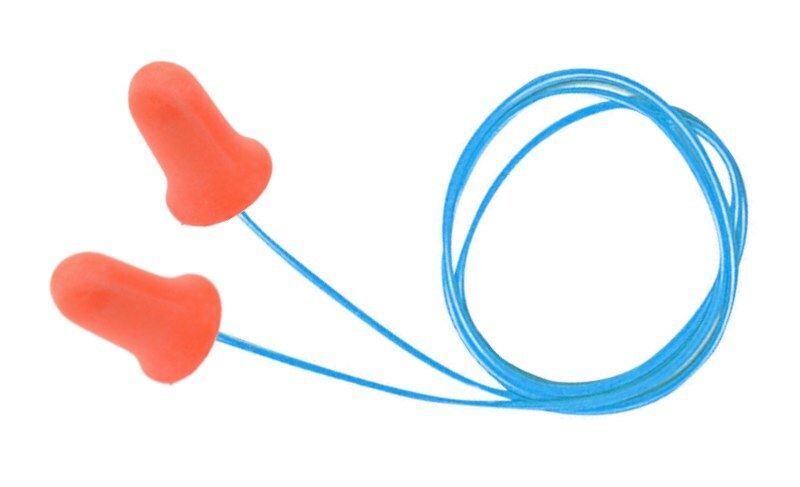 Hearing protection is available in multiple styles and colors. Single use earplus are made of soft polyurethane foam that expands to comfortably fit virtually every wearer. Available with or without cords. Minor abrasions, cuts or burns should always receive disinfecting treatment before applying a dressing or bandage. We carry Cold Spray, Antiseptic Spray, Burn Spray, Blood Stopper, Hydrogen Peroxide Pump, Alcohol Pump, Antiseptic Pump, Burn Pump. Our eye protection options meet or exceed ANSI Z87.1-2003 high impact standards, CAN/CSA Z94.3-07 and are CE EN166 certified. The economical wrap-around single lens glasses provide a full panoramic view and are available in mutiple lens colors: clear, gray, coffee, amber, orange, infinity blue, purple haze, silver mirror, blue mirror, i/o mirror, gold mirror. 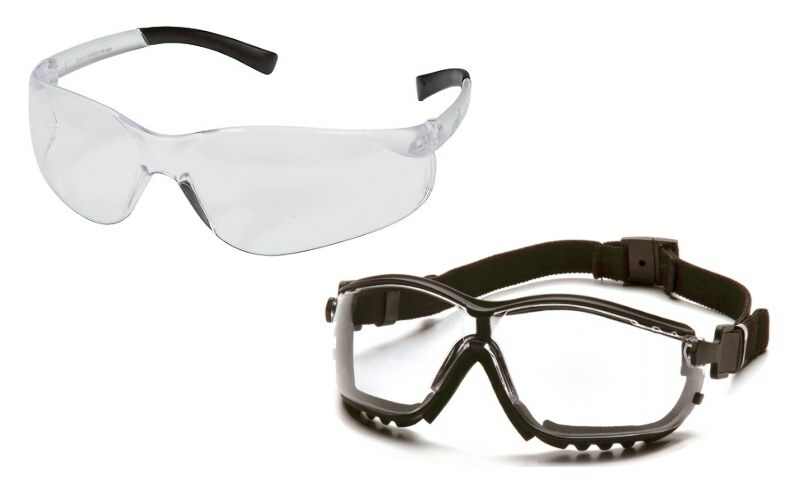 Goggles feature an anti-fog lens, adjustable headband, foam padding for a perfect seal. Available in clear, gray, and amber. 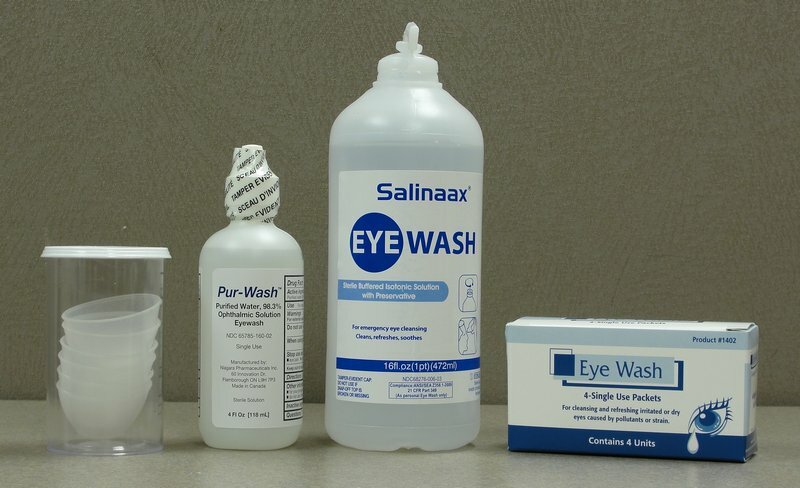 Eyewash / Neutralizer products are used for the cleansing and refreshing of irritated or dry eyes caused by pollutants or strain. Available in single use packets, and 4 ounce, 8 ounce, 16 ounce and 32 ounce bottles. 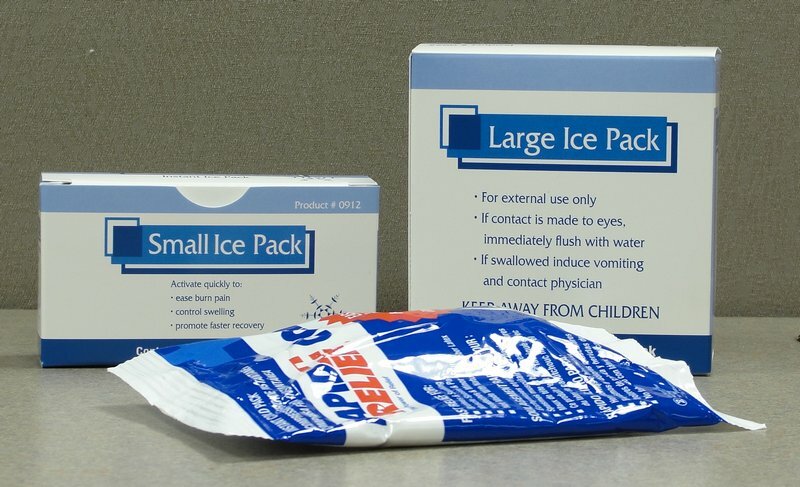 Instant cold packs provide relief to quickly ease burn pain, muscle pain, and control swelling. Available in Large and Small sizes. 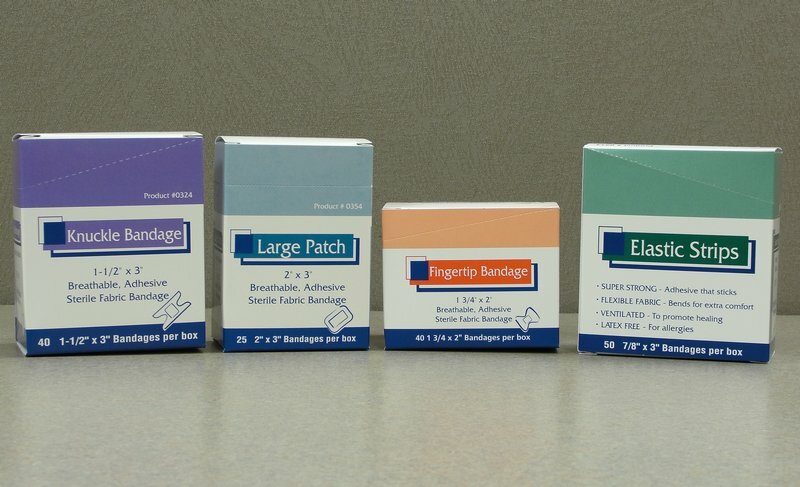 We carry a wide assortment of bandages including simple Plastic Strips, Fabric Bandages, Fingertip and Knuckle Bandages, Large Patches and more. We also carry Blue Metal Detectable Bandages for use in the food service industry. 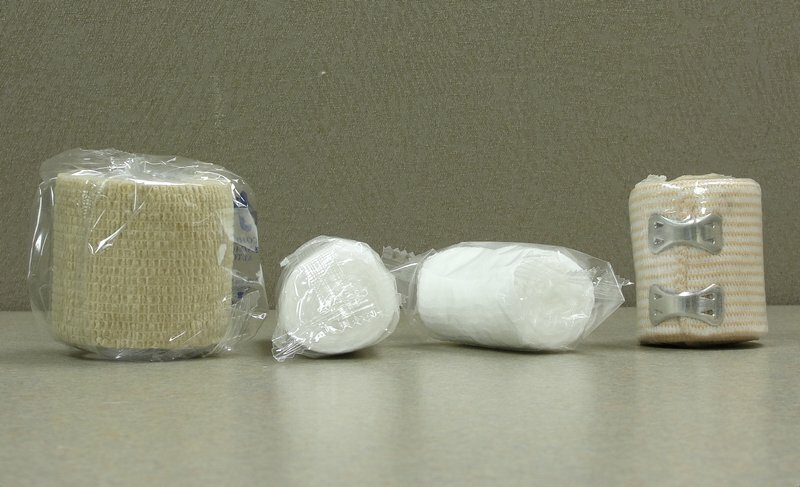 Sterile pads, gauze and wraps are absorbent and breathable. Excellent for conrolling bleading and preventing further contamination of a wound. 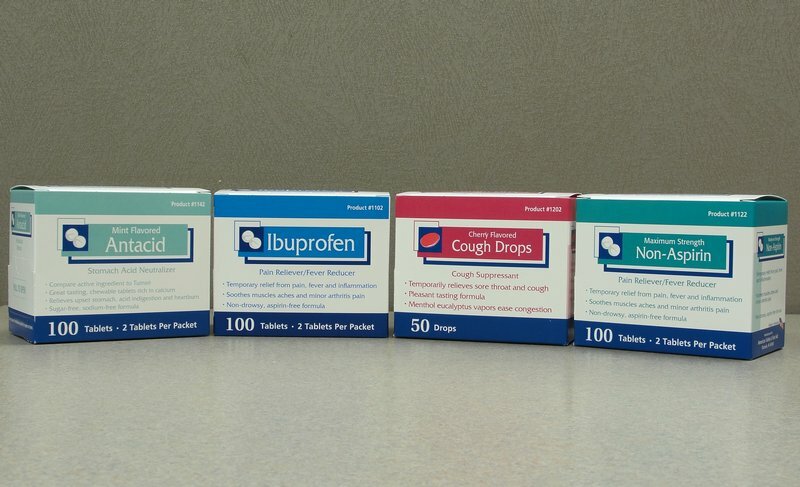 For pain relief and personal comfort we provide a wide selection of tablets including: Pain Reliever, Ibuprofen, Non-Aspirin tablets, Cold Tablets, Pain & Sinus tablets, Non Drowsy Decongestant, Antacid, Cough Drops. We also carry name brand products including Advil® Motrin® Bayer® Tylenol® Aleve® Excedrin® Zantac® Alka Seltzer® and Pepto-Bismol® . Looking for an OSHA compliant First Aid Solution?